An unforgettable honeymoon or a romantic short trip in the German capital? Would you like to enjoy a sightseeing tour through the German capital or would you like to immerse yourself in the unique world of glamour, style, fashion, art and music in the leading and scenic city of Berlin? Our double rooms in Berlin offer everything you need for a carefree stay in the city. 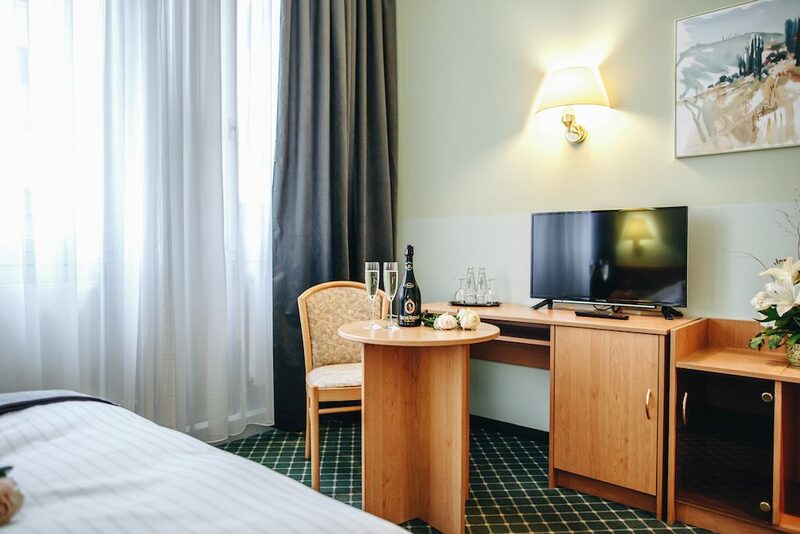 From free High-Speed WiFi to a comfortable king-size bed for rest and relaxation, to modern TV for cozy hours with numerous TV programs and a fully equipped minibar, the hotel Helle Mitte Berlin Hellersdorf provides all-round services. In addition, each double room has a spacious, clean and modern bathroom with shower and toilet and is equipped with towels, bath towels, soap and shampoo, and a hairdryer. In addition, each double room has a functional desk with chair where you can work comfortably, and a spacious wardrobe where you can store your clothes and belongings safely and comfortably. If anything is missing, our friendly customer service will be happy to assist you during the opening hours at the reception. In addition to numerous sights such as the German government building, the legendary Alexanderplatz, the German Wall or the historic Check-Point Charlie, the German capital has much more to offer its visitors, as it should be for a renowned world capital. With numerous cultural offerings, unique museums and beautiful parks, rivers, and lakes, the green capital invites to stay and discover. The fashion, art and music scenes great figures have settled in numerous places in Berlin and the trendy world city has to offer exciting experiences in this direction with a wide range of events, shopping opportunities and attractive trade fairs. Berlin's nightlife is known worldwide and offers a variety of scenes and styles for every guest. Culinary delights can also be enjoyed in the German capital. The offer is international and cosmopolitan, which provides many culinary delights for culinary discoverers. Thanks to our convenient location in Berlin Hellersdorf, you will benefit from excellent transport links to Berlin's public transport network, which means that you will always be able to reach your destination quickly and reliably, no matter where you want to get to Berlin. For those who want to travel by car, we provide a free on-site car park, so that you can have your vehicle at hand quickly, whenever you need it and always stay mobile. Gourmet breakfast included After a long night there is nothing better than to sit comfortably at the table. As an exclusive hotel in Berlin, we offer our guests an exclusive, varied and healthy breakfast buffet directly at the Hotel Helle Mitte, where gourmets and connoisseurs of different flavors can fully enjoy their meal. After all, they are supposed to start a new day full of energy and strength, because the German capital has a lot to offer, what wants to be discovered!